"The full circle, known as a Voronoi Diagram, represents the entirety of the $74 trillion global economy in nominal terms. 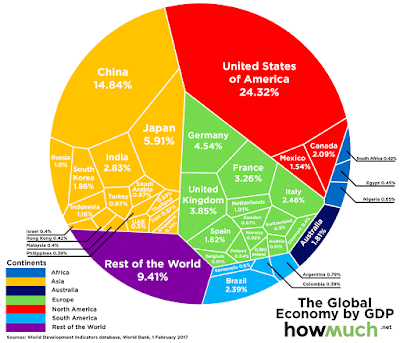 Meanwhile, each country’s segment is sized accordingly to their percentage of global GDP output. Continents are also grouped together and sorted by color." 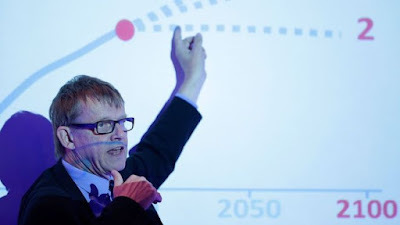 Pancreatic cancer has laid low Hans Rosling, the Gapminder co-founder and my favorite public health statistician and data edutainer extraordinaire. He has many remarkable TED talks and other videos online, but I personally favor his appearance at TEDIndia speaking on Asia's Rise where he compares global growth over 200 years and predicts exactly when India and China converge with the rich! UPDATE: Due to MIT's snow closing, our kickoff class was Thursday morning 10a-12n February 16th, 2017 in Media Lab E14-633. 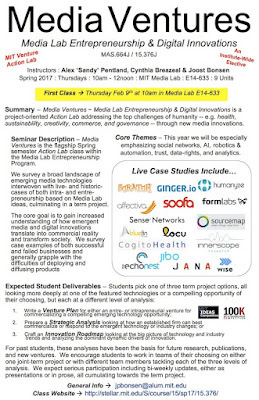 Our MIT Media Ventures ~ Media Lab Entrepreneurship & Digital Innovations class surveys a broad landscape of emerging media technologies interwoven with live- and historic-cases of intre- and entrepreneurship-based on new media ideas, culminating in a term project. The core goal of this Action Lab offering is for students to gain increased understanding of how emergent media and digital innovations translate into commercial reality and transform society. We survey case examples of both successful and failed businesses and generally grapple with the difficulties of deploying and diffusing products and as a means of exploring a range of business models and opportunities enabled by emerging Media Lab and related innovations. This year we will be especially emphasizing urban innovations, personal data rights, health, civic engagement, financial service innovations, mobile transactions, and social media generally with special focus on social networks, quantified self and society, AI, robotics, automation, and data analytics. Join us at first class Thursday morning 10a-12n February 9th, 2017 in Media Lab E14-633. 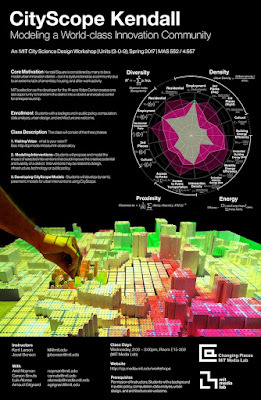 I'm co-teaching CityScope Kendall Square class this Spring 2017 together with MIT Media Lab colleague Kent Larson and team, starting Wednesday, 8 February at 2pm, as part of our MIT Cities Initiative. Kendall Square is considered by many to be an ideal innovation district -- but it is dysfunctional as a community due to an extreme lack of amenities, housing, cultural venues, and after-work activity. MIT’s selection as the developer for the 14-acre Volpe Center creates one last opportunity to transform the district into a vibrant and creative center for entrepreneurship. Students will explore an evidence-based, data-driven process that makes use of the CityScope augmented reality platform to design, iterate, and reimagine Kendall Square. Join us at first class Wed afternoon 2pm February 8th, 2017 in Media Lab E15-359.